First buried in an isolated grave 1/2 mile south-east of Lagnicourt, he was relocated to plot: VI, row: G, grave: 35 in 1920. GADD. - In loving memory of Private William Mansfield Gadd, eldest son of Ettie and the late Albert Gadd, who was killed in action April 15, 1917. "Greater love hath no man than this. For he is ever a hero, the man who dies. For his God, his country and King. Fond memories we will always keep, And ever feel the loss. Of a loving heart now silent 'neath a little wooden cross. He did his best. Along with the rest. of Australia's best." Inserted by his sorrowing mother, sisters, and brothers. GADD. — In loving memory of my dear friend. 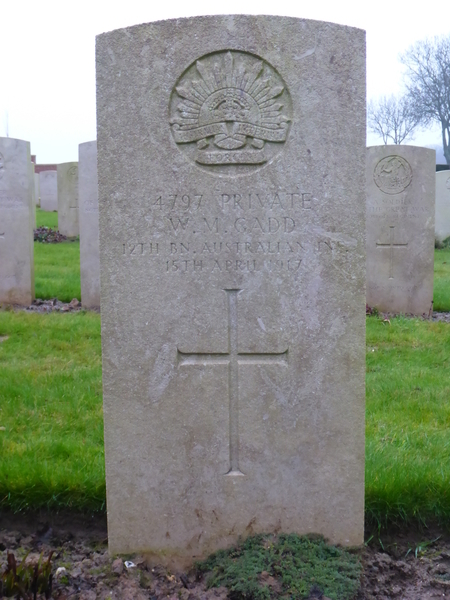 Private William Gadd (Billy) of Queenstown, who was killed in action in France, April 15, 1917.
" A hero like his father, For God, for King, and country His duty nobly done." Inserted by his loving friend, Charlie Kelly. 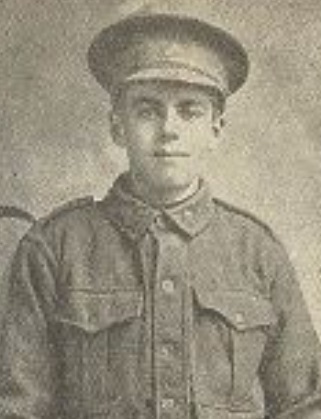 William was the son of Albert Mansfield Gadd, who assisted in the North Lyell disaster that occured on the West Coast of Tasmania in 1912. His mother's name was Henrietta Gadd (Carlsen), he had seven younger brothers and sisters.